I LOVE SOUPS!!! Seriously, there is something about warm, delicious soup recipes and the holidays that make me so incredibly giddy! 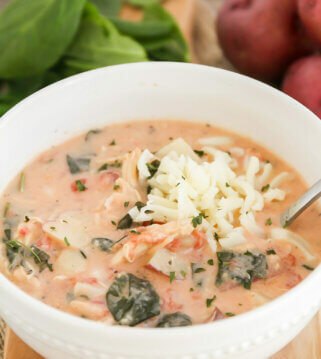 I think more than anything soup (like Cheesy Potato Soup and Italian Tortellini Soup) reminds me of the cooler weather which usually means the holidays are close by and that truly brings a smile to my face. 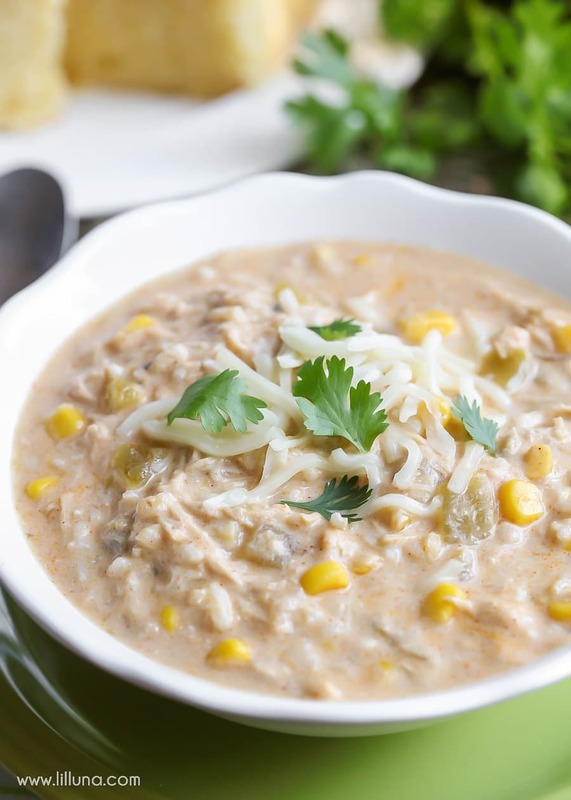 There are just so many wonderful traditions to celebrate this time of year, as well as so many delicious recipes to enjoy, like today’s Chicken Enchilada Soup. This recipe has to be a NEW favorite. It was SOO easy to make and turned out fabulous!! We’ve always been suckers for Green Chiles and Enchiladas, so making a soup version of these things sounded wonderful. This Slow Cooker Enchilada Soup recipe comes from HERE. I ended up doing a more simple version of it and was very pleased with the outcome. 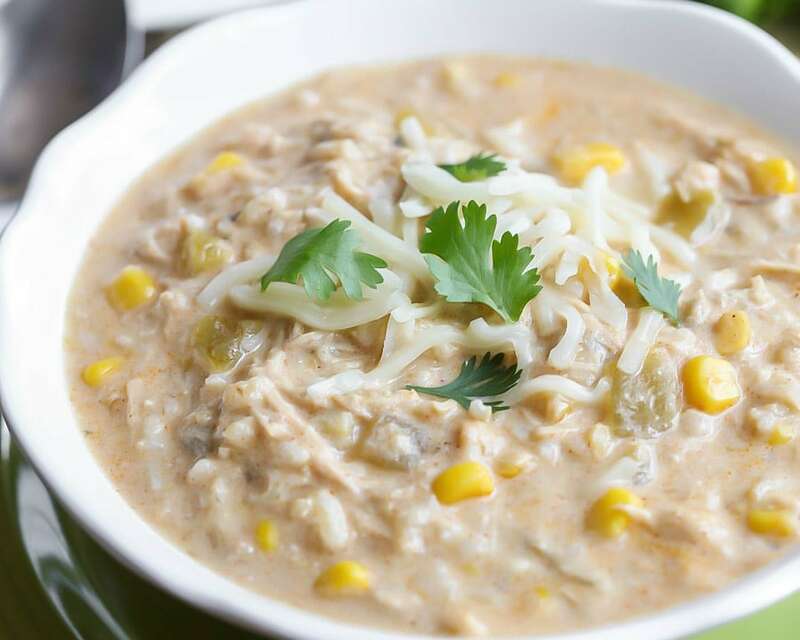 The combination of the chicken, green chiles, spices, corn and cream cheese (and all in the slow cooker) make this recipe irresistible and so easy. You really can’t beat throwing everything in the slow cooker and having a delicious meal within a few hours. Pretty amazing! The flavors of this green chili chicken soup really are phenomenal. It has all the ingredients similar to enchiladas but in a soup form, and looking at the list of key ingredients it’s not hard to see why this enchilada soup is so good! Best Toppings for Enchilada Soup? We love adding some cilantro and additional cheese. You can also add sour cream, avocados, tortilla strips and/or limes. Can you make enchilada soup on the stove? Sure thing! Just add broth, enchilada sauce, green chiles, water, cumin, chili powder, onion powder, garlic powder and chicken to a large pot. Bring to a boil, add rice and cream cheese and reduce heat and simmer for 25 minutes. Mix well so all cream cheese chunks are gone. Add salt and pepper and cheese right before serving. 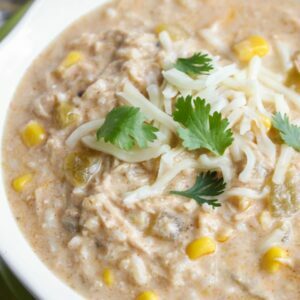 Crock Pot Green Chile Chicken Enchilada Soup - a new favorite soup recipe packed with chicken, green chiles, corn, rice, and mixed with lots of spices and cheeses. 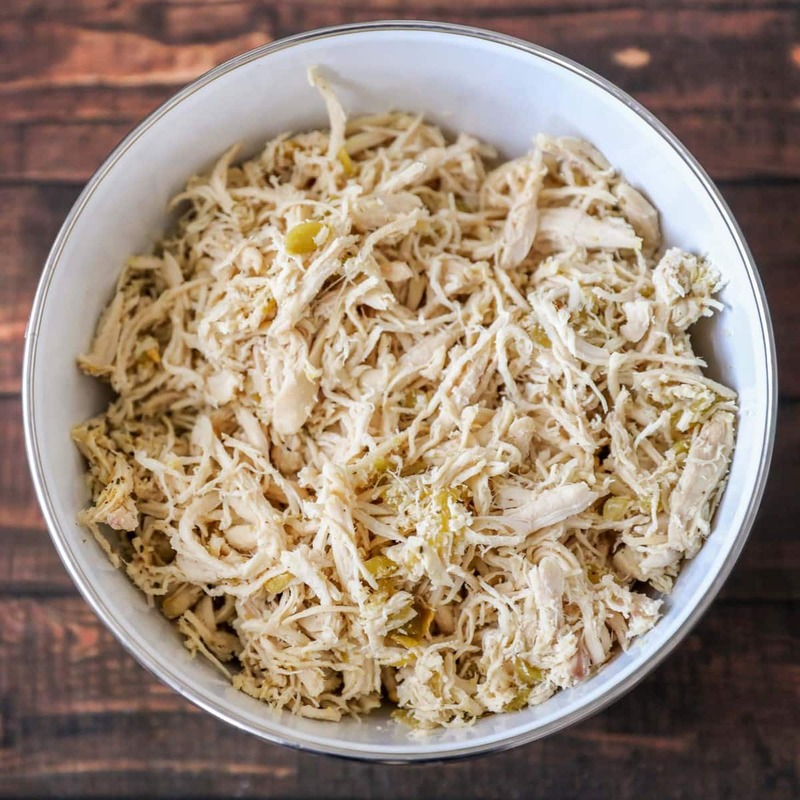 Place chicken broth, enchilada sauce, green chiles, water, cumin, chili powder, onion powder, garlic powder and shredded chicken in crock pot on HIGH. Cook for 3.5 hours. Add salt and pepper to taste and top with Monterrey Jack Cheese. Recipe adapted Scattered Thoughts of a Crafty Mom. Looks sooo yummy…just to be clear, I would add the rice uncooked to the pot, correct? Have you cooked it on low for 7 hours vs high for 3.5? Hi! I was wondering if you’d ever added frozen or defrosted chicken breasts to this and cooked for longer? I’m hoping to make this Halloween night but have such crazy day I was hoping to start it and come back to it later. Thanks so much! It looks amazing! I want to try the Crock Pot Green Chile Enchilada Soup. It asks for 4 chicken breasts. They come in many sizes. Could anyone give me an idea of how many pounds they have used? They all sound wonderful.. Thank you for sharing.. Anybody ever substitute wild rice for instant rice and plain nonfat yogurt for the cream cheese? Found your website by someone posting this recipe on Facebook. This recipe sounds delicious and was thinking of trying it tonight, but have a quick question…I have never used instant rice and I’m assuming it cooks quick lol, but I only have regular long grain rice. Do you think it would be okay to use that instead? I used cooked regular rice because I didn’t have instant. It was so good! My son told me to make sure I didn’t loose the recipe! Thanks so much for sharing that Vivian!! So, glad it worked out!! Made the green chili enchilada soup today and while it was delicious, it didn’t look exactly like the picture. When the cumin and cili powder were added it made the soup a light brown color. I used tablespoons as the recipe indicated TB, was that correct? Also, the cream cheese, was it supposed to melt into the soup because it did not. My guests thought it tasted good but the color was a little off putting. I did a similar recipe and because my cream cheese was cold, it took awhile to get it to totally melt. I’ll make sure it’s at room temp next time. This looks delicious and gotta try it! Thanks so much!! Hope you like it!! Made this today…..fantabulous!!!! I made a couple revisions… I used a cup of fresh green chile from Hatch NM… and I also added black beans to it. which I know is not typically in an chicken enchilada but usually on the side. I also marinated my chicken breast in a lime infused tequila before cooking & shredding…cant get any more Mexican than that. This is such a hit…it will be on our menu for our Super Bowl party in February. Your modifications sound great!! SO glad it was a hit! Love these mods! Do you subbing the cream cheese for greek yogurt would work out? 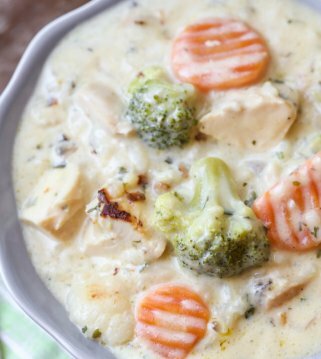 I’m making this today, quick question….I’m guessing you cook the chicken and shred it before adding to the crock pot? Just thought I’d just say that I’ve done it both cooked the chicken first and put it in frozen and raw. Either way works fine although shredding the chicken is a little messier once it is in all the soup but you can scoop it out, shred it, and then add it back in. I did cook it on high when the chicken was raw to make sure it was fully cooked. My kids and I love, love, love this soup. Have anything else similar? Has anyone tried to half the recipe? Just wondering if cooking time is still the same. Just wondering. Has anyone ever made this with ground beef instead of chicken? I have yet to try it with ground beef, but I think it would be okay. Turkey would also work really well. I have made the chicken enchilada soup twice now and my family loves it. this time we are trying it with leftover turkey..thanks so much for recipe. i took it to work for people to try as well. 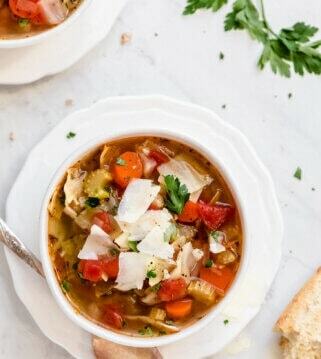 This is a really easy and great tasting soup, however, 4 chicken breasts, even of the smallest size are way too much. If you are looking for soup and not chili, only use two small chicken breasts. I (accidentally) left the cream cheese in this recipe and it was still really delicious! So if you are looking to keep it lighter, try that! I mean, aren’t we all? Haha, I really couldn’t believe I left it out, it was so good without it. It surprised me! Great, I’m not a fan of cream cheese and was wondering if i could leave it out. Just tried this recipe tonight. OMG! its absolutely delicious and my family loved it! Can’t wait to make it for my girl’s luncheon. Its perfect! This soup is totally awesome!!! My whole family loved it. Try it, you won’t be disappointed!! SO glad you guys liked it!! It’s so simple and delicious. Reminds me that I need to make it again soon. 😉 Thanks for stopping by!! thank you for the recipe! as soon as i found it, i had to make it. just a note to others…i had an issue, like someone else mentioned, with the cream cheese melting all the way. i had little clumps of white floating like yummy islands in a sea of delicious, lol. the two issues i could imagine are 1. i used neufchatel (aka low-fat) cream cheese, or 2. the cubes weren’t small enough. i’m thinkin’ more #1 though, because i let the soup cook an extra half hour to try and allow more time for the cheese to melt. it didn’t really help. so, anyone contemplating making this, go for the non-low-fat cream cheese. regardless…it was soooo good. thank you!! This recipe saved my life, last day of the month pantry pretty bare, a can of green enchilada sauce, chicken in the freezer, a can of corn, cupboard full of spices and stroke of luck when i found a little bag of instant rice untouched for months(my family would normally kill me not making pot of real rice with a meal). with a little help from google i came across this and was able to make a great meal. I dont normally cook food south of the border style(im just very unfamiliar with it, asian foods are my forte) but i sure like to eat it and this recipe was just what i needed today. ty so much. Great recipe. My aunt made this soup and it was a hit with my entire family. So I decided to try to make it myself. Though I did change it up a bit. I doubled up on the spices, then I also added Cajun spice, and a few pinches on cayenne pepper for some heat. Instead of 2/3 cups of Rice, I added a whole cup. It made my apartment smell amazing. Though, I must say that it seems to serve more than 4-6 people. I had two big bowls, and it barely made a dent. Oh.My.Goodness! This was absolutely amazing! I also used low fat cream cheese because we are trying to slim down and had the “chunk” issue but just mushed them out with a spoon. Can you tell me if this freezes well please? I froze some and it worked out fine! Made it with cumin seed and again with ground cumin. Using the seed was my favorite. Have you tried the recipe without cumin? I am allergic to cumin, but the soup sounds wonderful. I know my family would love it. Ohhh, I made this recipe tonight and it was fabulous! I put regular rice in from the start and cooked it on high for 4 hours. We’re also dairy free so I used Daiya cream cheese substitute (but only 4 oz) and it was delish! Thanks Krystin! Just wanted to share that I made this soup for a contest at work today and I WON! It’s soooo good. This was my first time making it but I will definitely be making it again!!! Thank you for mentioning green chile! We would love to send you a free box of our Hatch Green Chile to say thank you. If you’re interested, please send me an email with your heat preference and address. any suggestions for substituting out the cream cheese? That’s the only thing putting me off from this recipe, everything else sounds delicious! Made this on a campfire in my dutch oven. Wonderful out here in the wilds of S.W. Utah, so good it will be a staple in all my camps from now on! Thanks so much and I will be looking forward to trying more of your recipes on every trip! Thank you so much for letting me know that! That sounds so delish in a dutch oven! Glad to know it works great for camping! I am making this tonight for a group, but now I am even more intrigued to take it camping with us and cook it in the dutch oven! What a wonderful treat that will be! You should!! Let me know what you think! Thank you!! Is this by chance gluten free? I’m not a pro on everything that gluten free need to avoid…take a look at the ingredients and hopefully, you can tell right away. I’m sorry, I wish I knew!! I need to study that more!! I thought the overall flavor of this was outstanding! I loved the cumin and the spices with the addition of the rice and corn. I used a shredded rotisserie chicken due time constraints and it was perfect. The only thing I would say is the entire block of cream cheese made it incredibly rich. It was almost like a chowder instead of a soup. If I were to make this again (which I definitely will) I would probably use 1/3 of the block of cream cheese so it is a bit lighter and more soup like. It was really tasty for sure! Thanks for the recipe! Thank you so much for sharing that!! I’m glad you liked it 🙂 Thanks for giving it a try!! I honestly haven’t tried that, but if they are cooked already, it should be ok. Hope that helps! Thank you! I did that because I also made a double batch and it worked out just fine! It was also a lot easier to dissolve the cream cheese with it over the stove top! I made this soup for my work Christmas party and it was a hit! Everyone loved it. It definitely had a little kick to it which I loved! I would recommend this for anyone to make. 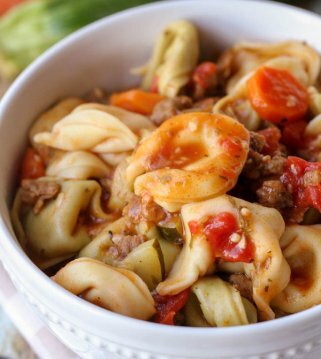 Super simple directions and delicious! So glad it was a hit!! Thanks for passing that along and for making it!! Brown meat and add onion and cook until transleucent. Heat thru and cook rice. Add 1 8oz brick cream cheese and stir until melted. Seems delicious, thank you for sharing that!! Hi. This is very tasty and family likes it. I cooked king grain rice in chicken broth before hand and then added it in the last 30 min as we are not insta rice fans. It does not come out as pale as the picture; probably would need to use more than 1 cream cheese. Do you have any nutrition info? Just looking for calories per cup without the added on shred cheese etc. Have made it twice already and family loves it. Thx! I’m glad your family likes it! 🙂 I do not have the nutritional info, I’m sorry. Thank you for trying this recipe! I just got through adding the ingredients to my shopping list. I am trying really hard to watch my carbs, so what I will do is put cooked rice and corn on the side, as well as avocado, fresh tomatoes and cilantro. Everyone can just add those ingredients themselves as desired. I’m a little torn over the cream cheese, but I think I will just use a little less as suggested in one of the comments. I have a Spaghetti Squash that needs to be cooked, so perhaps I will use that for my rice substitute. I can’t wait to try it! That all sounds great!! You keep going girl 🙂 Let me know what you think! Oh, that makes me so happy to hear!! Thank you so much! Oh, no..I’m sorry. I haven’t had it burn on me before. I wonder if your crock pot gets hotter than mine. Hopefully, you’ll give it another time. Thanks so much for trying it!! I’ll have to think about that! Other, than just adding crushed oreos, I’ll have to figure out a way to make it. I am going to make it this week. You are the 1st person I have seen that uses Mexican Reicipe. I love Mexican Spice use it all the time. Thank you! Please let me know what you think? I hope you like it! Has anyone ever made this with white beans instead of rice, like a chicken chilli? I have ! (Not Lil Luna’s) but very similar. Very Good ! This is a fantastic recipe! I have a batch in the crock right now and my home smells amazing! Thank you for sharing! You are so welcome! I hope you liked it! Do you have the nutritional information for this soup? I LOVE it!! My picky kids loved it too!! I’m sorry, I do not. I’m so glad your kids liked it! Makes me so happy to hear! I made this today and my family really enjoyed it. I used ground chicken and since I had to brown it anyway, I added 1/2 an onion that I had on hand. I used riced cauliflower instead of rice with good results and making the soup lower carb. The cauliflower doesn’t absorb liquid like rice would, so adding the extra water wouldn’t be necessary. I whisked the soup right before serving to mix in the cream cheese as much as possible. Will make again; thanks for the great and easy recipe! You are so welcome! Thank you for sharing your changes! This is very good. I would suggest you bring the cream cheese to room temperature and then cut to small pieces as it took awhile to melt and mix with the soup. I’m so glad you liked it! Yes, that would help, too! Thank you! DELICIOUS!!!! I ended up not cooking it in the crock pot and cooked my chicken and put it in the soup and followed the recipe except the rice. I cooked the rice separately and added to the soup when I put it in the bowls. I will definitely make his again and can’t wait to share this for a party!! Thanks so much for sharing your changes! Glad you liked it! Thank you & have fun! This is my family’s favorite recipe! We’ve started making it in the instant pot, cooking the chicken in broth using the pressure cooker function and then making the soup following the directions using the slow cooker functionality. I also add a can of cannelini beans at the same time as the corn. So good! Sounds perfect!! Thanks for sharing! Do you have the nutrition information somewhere? We make this all the time. I am sorry, I do not 🙁 I know there are sites where you can put in the ingredients/amounts & it will tell you. I know this seems silly but could you use red sauce? Thanks! I haven’t tried, but love experimenting! So…I’ve made this recipe so many times bc it’s delicious however THIS time I didn’t review the recipe and added TWO 32oz cans of green enchilada sauce! ???? Should I still add the water? And can this be saved? Uh, oh! How did it turn out? I’m sorry I didn’t respond sooner. I don’t think the water would have been needed. I am glad you like it! It stil came out delicious! 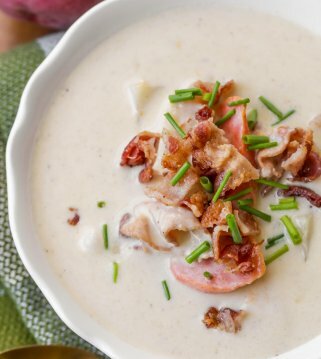 This soup is practically fool-proof! Lol I ended up doubling it and had more to share with friends. Thank you for this gem! I’m planning to make this, had a quick question.. can I omit rice in this soup? Will it still come out good? I just made this soup and it was delicious!! I used a fresh garlic clove an a medium shallot. I also used uncooked quinoa and Greek yogurt. I also added a can of black beans. It was a perfect Sunday dinner. Love how easy this was to throw together and the flavor is amazing!! I am so glad you think so 🙂 Thank you so much! I am right there with you! They are the best! Thank you! I can’t wait to make this one. Yum! I hope you like it, as much as we do! Just set a goal to make more crock pot meals on Sunday so we can home to a yummy dinner. 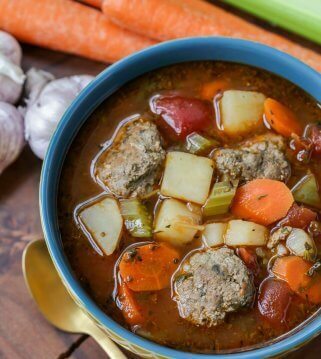 Adding this soup to my list! My family & I love this soup. We don’t eat rice so I use cauliflower rice & it is just as good. I also use rotisserie chicken that I shred & cook it on the stove because I can’t wait for the crockpot! Sorry, raiting was supposed to be to be 5 stars!! Sounds perfect!! I will have to try with the cauliflower rice 🙂 Thanks for sharing! My family and coworkers both love this and it is so easy to make! Hoping to make tONight… two questions. What if you wanted to cook on slow iN the Crock pot? WHAt amount of time would you suggest? Do you think this recipe would work well halved? Yes, you could definitely half it & you could cook it on slow for 6 hrs. It may be ready before that, but you could check at 5 hrs. Hope you like it! So good and so easy to make!! My kids love this! I am glad they do 🙂 Thank you for trying it! Tried this and LOVED IT!!! Huge hit with the kiddos (ages 4 & 8) and my husband. Printed it off as a go to meal for us! Paired it with fresh bread from our local bakery, yum! I am glad you think so!! Thank you so much! I loved the soup but nowhere in your recipe you specify, that i coUld find, th3 size of the crockpot needed to hold this recipe.